Diversity is crucial for the biological health of our soils – that was the conclusion of a series of soil workshops held in October in Victoria. Soil microbial ecologist Dr. Helen Hayden was the guest of honour and has spent the past 10 years researching soil biology. She discussed with the farmers and researchers how a diversity in food sources is required to feed a wide range of soil bugs. Run by Agriculture Victoria, Geelong Landcare Network and the Surf Coast Inland Plains Landcare Network, the workshops were part of the Corangamite CMA Land Health Program. 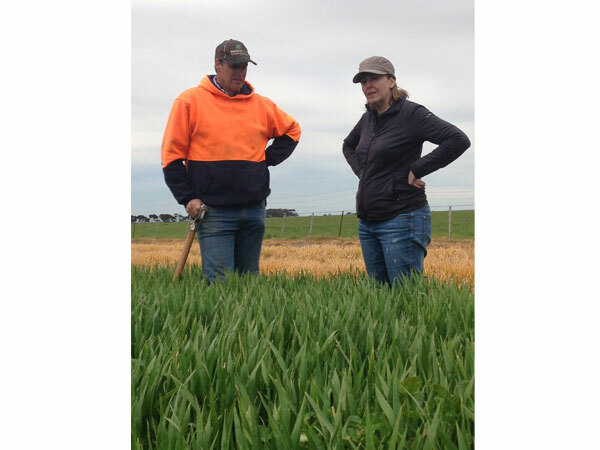 Evan Lewis, cover cropping advocate, and soil microbial ecologist Dr Helen Hayden, in Werneth, Victoria. Dr. Hayden described how the macrofauna and mesofauna ­– those bugs big enough to see with the naked eye, such as earthworms, beetles and mites – break down plant material, roots, and stubble into particles small enough for the microfauna and microflora, such as protazoa, nematodes, and fungi, to digest. These microscopic bugs are the ones responsible for nutrient cycling, soil structural stability and other critical functions in a healthy soil. The different bugs have specialised mouth parts, specific to a food source. A diverse range of food sources are needed to maintain a range of soil biology that forms the soil food web. The more diverse the soil biology, the more resilient the soil is. If climatic conditions or the use of an agricultural chemical do not suit a particular species, another type will be available to take over the role. Increasing the organic matter in the soil provides not only a food source for the soil biology, but also allows greater water holding capacity and improved soil structure. This was demonstrated at Evan and Suzanne Lewis’s sheep and cropping property at Werneth, Victoria. In 2014, Evan and Suzanne volunteered the worst paddock on their farm to trial “cover cropping” as part of the Corangamite CMA Land Health Program Cover Cropping project run by Southern Farming Systems. Since that time, four different summer and winter cover crops have been planted using a zero till disc seeder, all containing many different plant species. The aim was to use plants to encourage soil biological activity to improve the structure and fertility of a waterlogged, sodic clay soil. Today, although the region has experienced the wettest winter in years, Evan and Suzanne’s trial paddock hasn’t suffered from waterlogging, and is thriving with barley and clover. Dr. Hayden demonstrated the simple methods producers can use to monitor the biology in their soils, identifying a number of bugs with the naked eye, at a workshop held in Maude, Victoria. Modern lab based techniques to measure and monitor soil biology were discussed, along with the importance of taking multiple samples from across a paddock, as soil biology is highly variable within a paddock. The variability of topsoil depth was also demonstrated at Peter Stray’s grazing property at Maude, where two soil pits were dug 15m apart, with topsoil depth varying from 10cm to over 30cm.